Phillip C. Holliday Jr. of Billings, Montana is in a bunch of trouble after his truck ran a red light and almost crashed into another vehicle before making an "erratic U-turn" through a gas station and crashing into a light post. Fortunately, nobody was injured in the incident. When questioned by police, Holliday told them that they should be talking to the real culprit...the unicorn that had been driving his truck at the time of the accident. This is Holliday's 6th drunk driving arrest and mostly likely will be his 6th drunk driving conviction. *Thanks to Howlingjay for the tip. I hear ligers aren't very good drivers either. Why don't unicorns use magic? 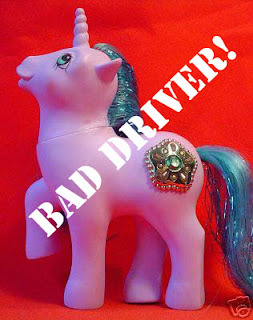 I bet that unicorn was drunk and just giving other perfectly responsible unicorn-drivers a bad name. No, no, no. Unicorns have drinking skills, Ligers have driving skills and Uniligers have drunk driving skills. Goshhhh! I miss my "My Little Pony" collection.